**PLEASE NOTE: you will need to fill out additional paperwork upon arrival of your appointment. Dr. Moore joined Allergy & ENT Associates in 1985. She is certified by the American Board of Allergy and Immunology and by the American Board of Internal Medicine. 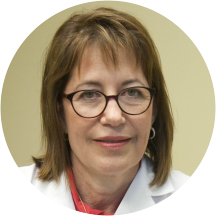 She received her medical degree from the University of Texas Medical Branch at Galveston, where she also performed her internship and residency in internal medicine, in addition to her fellowship in adult and pediatric allergy and immunology. Dr. Moore is a well-known speaker and teacher on both allergy and asthma. Her experience facilitating educational seminars on these topics, for parents and children in the community, has given her an increased understanding of family issues that complicate the treatment of these disorders. According to her treatment philosophy, diagnosis includes giving patients the personal attention necessary to determine what lifestyle factors are influencing their disorder and thus the course of therapy. Dr. Moore is the mother of four children. I thought Dr. Moore was wonderful. A great personality, excellent listener, obviously very experienced in her field, spent time with me without rushing. Great to get some answers. Dr. Moore was very knowledgeable and gave me a great plan for wellness. Dr. Moore is thorough and professional. Everyone in this office is friendly and professional. Dr. Moore is an excellent doctor. I highly recommend Dr. Moore. Dr. Moore is very kind and thorough. This was my first time seeing her and she did not disappoint. Dr Moore was so kind and knows her business. She took a lot of time with me. I would highly recommend her! Staff was very professional too. Dr. Moore is fantastic. She really listens and has a great bedside manner. The staff was extremely helpful and kind. Dr. Moore blew me away with her compassion and genuine concern for my wellbeing. They appeared to overbook Dr. Moore. I waited over an hour in the waiting room, then another thirty minutes in the exam room, before being seen. Dr. Moore and her staff are very friendly! It was a very good visit! She's to the point, professional and there to help! Made me feel at ease and gave me a sense of hope! Dr Moore explained what my son's symptoms were indicative of and what treatments that we could use to make him comfortable. She listened to him and made his treatments age appropriate and as easy to follow as possible. She made himfeel comfortable and encouraged him to communicate whether his condition improves and the treatment prescribed is helpful. He felt positive and had confidence that she was doing all she could to correct his issues. Everybody are so nice and professional ?????? Dr. Moore was fantastic. She took the time to do a very thorough history and physical exam. I wish there were more doctors like Dr. Moore. I would recommend her without hesitation for anyone needing an allergist in the Houston area! Dr. Kristin Moore, MD has no appointments on Zocdoc right now.